StoneGable is at its best when it is full of guests. And from Thanksgiving till after the New Year our home is often busting at the seams! We love to have our family and friends spend time with us and celebrate… and that includes all the doggies too! We often say that StoneGable is more like a hotel than a home! 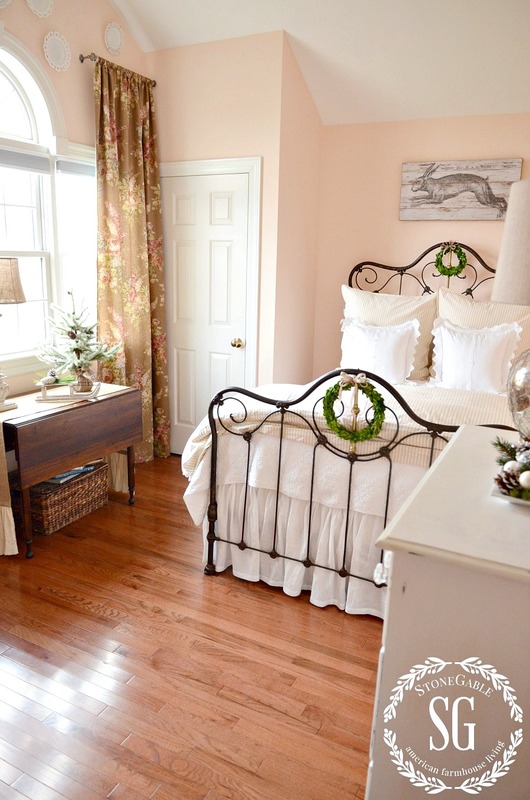 Did you know that we have four guest bedrooms and 5 bathrooms? Believe me, nobody needs 5 bathrooms! 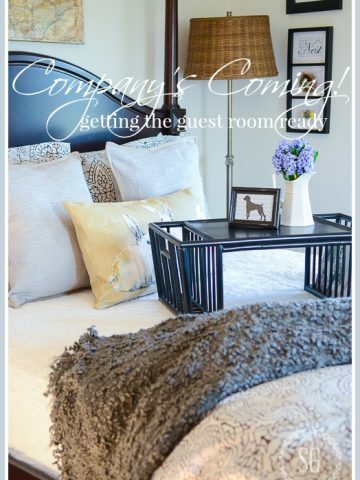 With all our family and guests… and dogs… coming and going I need to keep our guest rooms and bathrooms sparkling clean and smelling fabulous! Here are a few easy and doable ways I keep everything clean and keep sane doing it! 1. USE ALL WHITE LINENS! This is my number 1 tip!!! White looks gorgeous on a bed and can be accented with any color duvet, euro shams and pillows. White also cleans so beautifully. 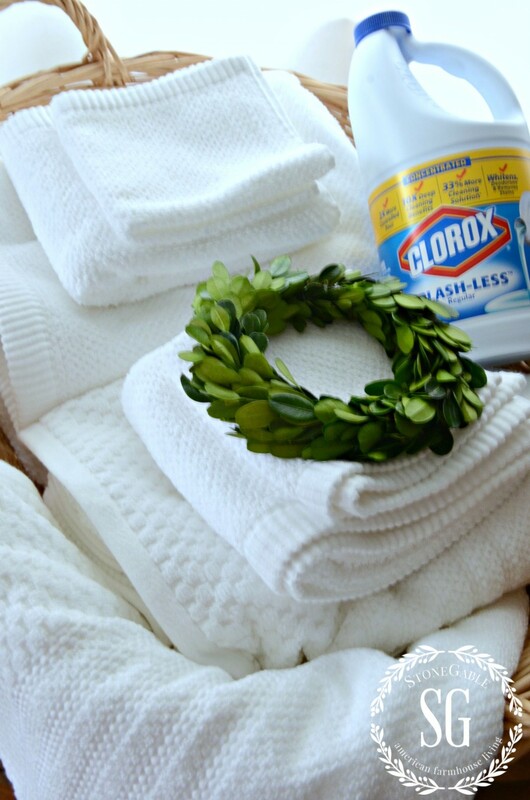 Stains are no match for Clorox, my number one choice for laundering my white linens! It not only whitens and packs a stain fighting punch but disinfects too! And at a bargain price. One cup of Clorox whitens twice as much as the bargain brand and disinfects 33% better. It’s important for me to know that my guests are slipping into crisp, clean bedding that have been disinfected too… just like the one’s my family have on their beds! We are white towel people! I can find fabulous white towels on sale or at discount stores everywhere! Very economical! They also mix and match well! I keep white towels in each guest bedroom’s chest of drawers. I really don’t worry that the sets match, because they all white and look great! How easy is that? My guests can make piles of towel laundry… especially the teenagers!!!! Since all the towels are white there is no sorting. Everything goes into the washer together! And I can launder them in hot water and 1/2 cup of Clorox Bleach and they come out of the dryer perfectly clean and white. Just a quick fold and back into the guest room they go! Yours guest will thank you if they don’t run out of these necessities! Empty trash can every day and clean them so germs stay at bay! It only take a minute and your family and guests WILL notice! Everyone who loves cleaning bathrooms raise your hand!!! I didn’t think so…Let’s be honest, most of don’t like cleaning bathrooms. But we all love it when our bathrooms are clean and disinfected! I don’t use a plethora of cleaning products. Too much work and money!!! To deeply clean and disinfect bathrooms before and after they are used by guests I “swish and swipe”. You can find how easy it is to clean and get rid of “potty germs” and other bathroom messes HERE. Cold and flu season abounds during this time of year. Make sure you wipe down non porous surfaces that are touched often with Clorox to keep these illness at bay! Refrigerator handles, door knobs, phones, and more! Things we don’t often think of! We want to spread Christmas cheer, not germs, colds and flu! We want to Fa-la-la not snif-snif-snif!!!! This is such a busy time of year with lots to do and so much fun to have. Let’s make our holiday happy, healthy and clean!!! I want to thank the kind people at Clorox for their great products and sponsoring this post. I use Clorox and all the opinions are 100% mine! 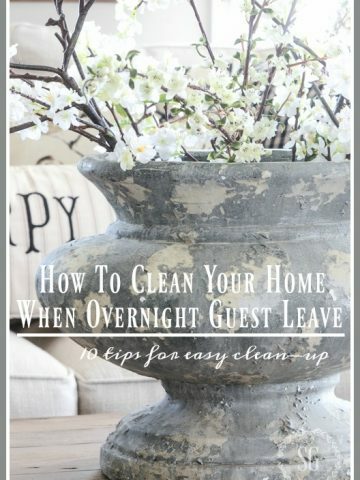 You might want to pin this to your GUEST ROOM or CLEANING TIPS or CHRISTMAS Pinterest board. 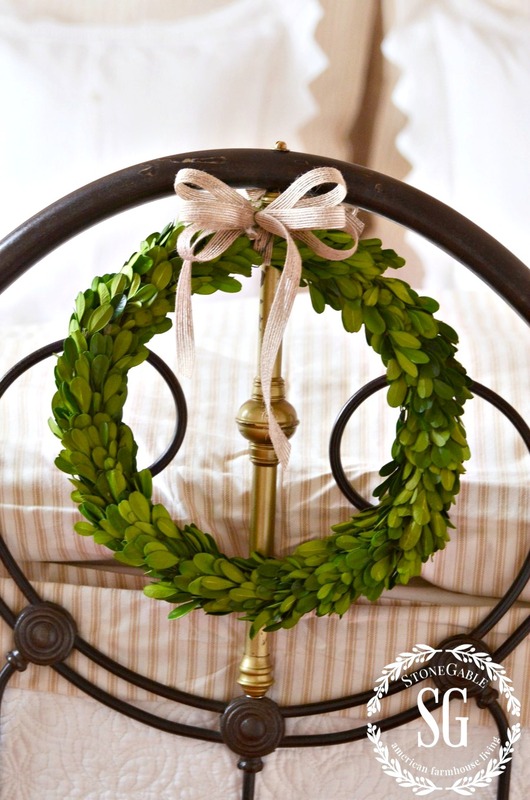 You can follow me on Pinterest HERE and see all the last minute Christmas ideas I am pinning! We only white washcloths BUT they’ve started looking VERY shabby ? They looked pretty like yours, only till 6-7 washes. Any special detergent? I’ve been using Method, for years. I bleach mine. But all washcloths have an expiration date and then I replace them. thank you for posting your tips! the all white is a fantastic idea! So cool advices! My family is going to visit me next week because I have a birthday and I want everything to be perfect for them. Thanks for the nice article!Coombe Carpet Cleaners Ltd.
Great tips. I forget about the guest room all the time, until I have to hurry and clean before a guest arrives. This will help me keep it clean year round. I LOVE all your posts and eagerly await each one year around! A cousin and his wife own a beautiful vacation rental home in San Francisco right in the City. Very nice home. To affirm your suggestions I wanted to share that their experience is people take better care of their vacation rental home when they have white towels and linens. They believes it’s phycological. However, history has proven they have less mess or damage when the guests leave. They use only white towels, linens and even kitchen towels. Another tip they shared, that I use in my guest bathroom, is always get extra white wash cloths when your guests are young women. Mascara and some makeups can’t be removed in laundering even with Clorox. Plus they always provides Neutragena Makeup Remover towelettes for his women guests. That’s another good tip I use to save my white guest washcloths and towels. I also shop Bath and Body Works for their specials on the mini sized body washes, body lotions and body sprays. I leave a cello bag tied with a pretty ribbon and a personal handwritten note welcoming our guest(s) by name with one of each in a fragrance I think they would like, (masculine for our male guests) or a neutral scent like Clean Cotton when a couple stays with us. I leave this gift on the bathroom counter to greet them when they arrive. I believe you also leave a personal welcome note for your guests, like I do, in the guest room. At my house that handwritten welcome note is next to a cello bag tied with pretty ribbon that includes chocolate, and/or a wrapped treat (season appropriate) and a bottle of water. I resupply the bottled water each day as needed. 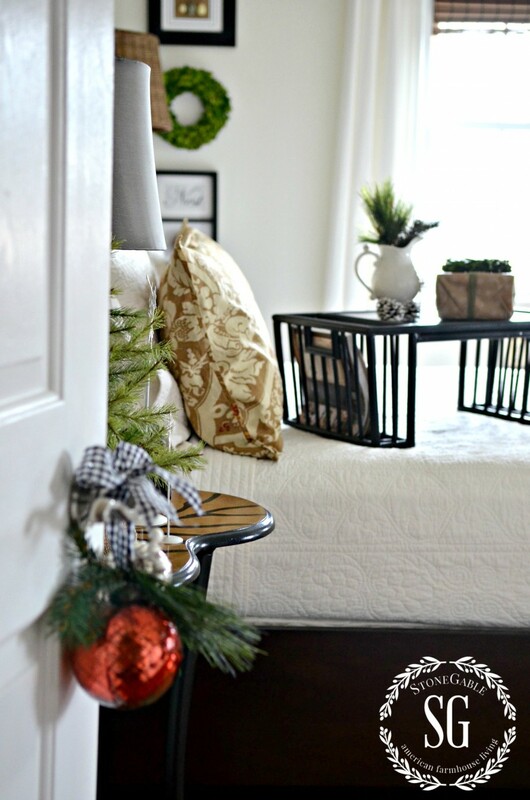 I use a Christmas gift tag for the handwritten notes in both the guest room and guest bathroom. I love all your suggestions throughout the year. I treasure your Sunday posts always. Thank you so much! You are a woman after my own heart! God bless you always. Merriest of Christmas’! Yvonne: I have been using white towels in our bathroom for the last two years. along with the clorox so that my towels can be just as clean as yours? Will really like to try white towels in the kitchen also if I can find some nice ones. one I go to wach day. Denise, I feel like we are friends! You have been with me for years and are so encouraging! I’ll email you about the detergent I use! Merry Christmas! You can spray and let it stand for 2 minutes, no rinsing is needed; you can wipe it off with a paper towel (after 2 min.) if you prefer, but I let it air dry. I use it on door handles, kitchen/bathroom faucets in between cleanings, counter-tops, toys (even baby toys–it cleans and sanitizes between play time)…anything that has a hard, nonporous surface you want sanitized. This is my first time to comment, but I love your blog…I am a Southern Girl, too. THanks so much for this wonderful info. the spray would be fabulous to take to a hotel!!! Thank you for giving a little ‘push’ to do what my heart has been telling me to do – go with white towels. And now I’ll add white sheets and linens in the bedrooms, too. I’ve always thought it made sense to have white fabrics that could handle bleach. I’m going to check out some of the other Clorox products, too. I love stopping by to visit and see what you have to share. You always inspire me! I love white linens and towels as well and have been using them for years. Did you know…. white towels are dyed white. I have found that bleaching towels does indeed take out the white and leaves them gray over time. So I’m ready for some help in getting rid of the gray. I know replacing them is the best solution but they were good towels and I hate to recycle them !! Any help out there ??? off to the store for wipes and disposable hand towels with our momagram on them. FUN !! I did know that. I’ve never had a grey towel… I guess I recycle them when they start to get a little frayed. Could you please share where to purchase the lovely black “breakfast-in-bed” tray in your pics? 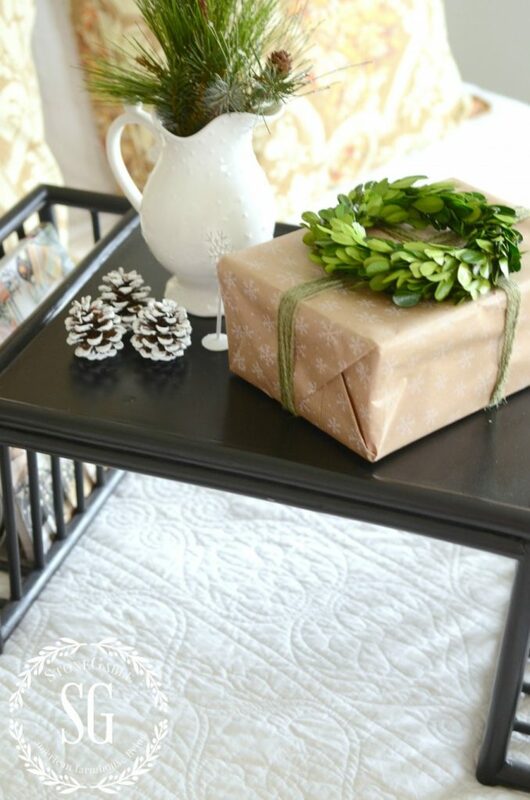 I have an old white wicker tray that I purchased at an estate sale, which everyone wants, once they see it, and would love to purchase additional trays for gifts. As usual, your post is absolutely stunning- thanks for sharing such great ideas and beautiful pics! Hi Debbie! We are a big fan of having a breakfast tray for guests. I got mine at a POTTERY BARN OUTLET. Hope this helps! Loved your helpful tips and beautiful photos Yvonne..
Okay- call me crazy but I was soooo excited to read your post that you love Clorox too! As a matter of fact- today i switched out my regular white sheets for my white flannel ones and laundered them before putting them on the bed just so I could use Clorox on them! Even in south Florida flannel sheets are a treat and I love the fresh smell! I love white bedding and towels. Reminds me of staying in a hotel – and it doesn’t have to be a super fancy hotel – any place where I don’t have to make the bed and pick up the towels is a treat to me! I know just what you mean!!! Your guest room is lovely, Yvonne. 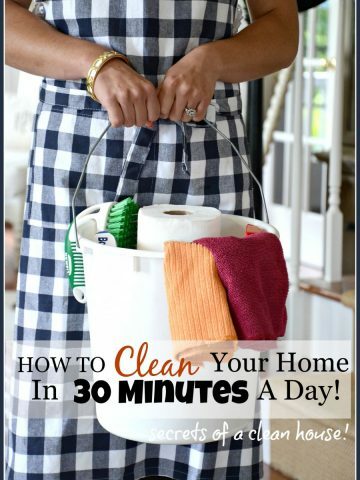 Great tips and I too use Clorox (love the splash less too.) I have been switching over to white sheets and towels the past few years and love them. I still have some blue hand towels, bath towels and facecloths in our teen boys’ bathroom but will be weeding them out as they wear out. I use white towels in our ensuite and decided to do a trial run of white hand towels in our main floor powder room a few months ago. They do clean up well even with guys and all their friends. I like to change them out to freshly laundered ones frequently and the white really appeals to me. Wishing you a very Merry Christmas! Thanks Elizabeth… yes white towels are really very practical!! 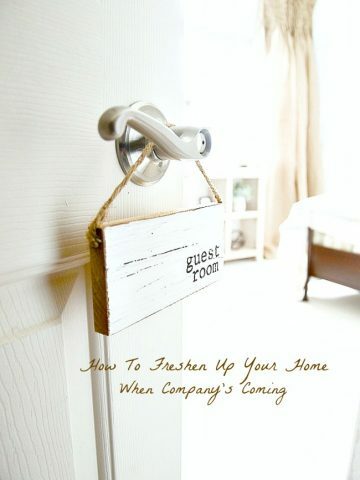 I love your useable ideas and think guests would love to visit your home. I hope mine feel the same as we, too, entertain a lot and I realize how important it is to make guests feel welcome and special without killing myself!! I hear you calling my name! Other than wedding gift linens, way back in 1969, all I have are white for us and guests…so easy with Clorox and always new looking. I do put out fancy decorator-look towels that match my bathrooms, but no one uses them as they are not placed near the vanity areas and I use cute paper towelettes in the powder room. As you say, you can always add color touches to white. Sounds like you may need five bathrooms with all the company you have together at one time lol! Another little tip I learned: add Clorox after each “major” potty event and you stop e-coli from going air-borne, reaching toothbrushes and the air one breathes. Takes away the bad odors as well. You are a smart one Bobbi! Thanks for the tips! I love white towels in my bathrooms as well. Recently we had guests at our home and I was asked if it was okay to use them? I think people are intimidated by the use of white towels but they’re actually very practical. By the way Yvonne, I love your carmel-colored pillow shams. Do you recall the name of the manufacturer? They are from my local POTTERY BARN OUTLET. Hope this helps! You just might bump into me there. That’s when I stock up and replace. Thanks for this post and the beautiful pictures!! You have made me totally rethink the whole white towel thing! I am a towel snob and love big, thick, luscious bath towels!!! But if I can get inexpensive quality towels at T.J Max or Home Goods I think I am going to invest in White Towels from now on, they do go with everything and as you said they mix and match so perfectly! Have a wonderful Christmas and New Year!! 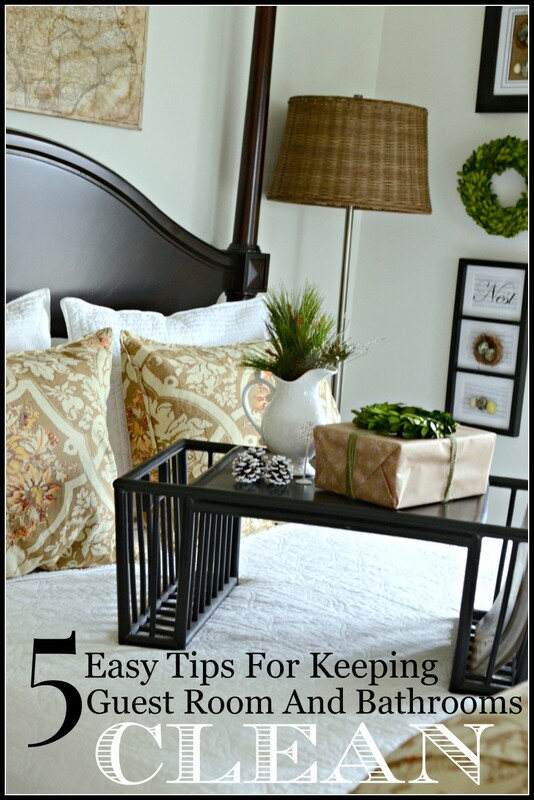 Great tips and much appreciated since I have two boys home for Christmas. I also use all white towels and bed linens. I also keep a basket of grooming products on the bathroom counter in case they forget anything. I stock it newly purchased body wash, body scrubbers,shampoo, conditioner, toothpaste ,tooth brushes, rolled up wash cloths,etc Merry Christmas! Great tips Yvonne. I’ve always been afraid of white towels and you’ve given me the courage to try them. Merry Christmas to you too, Sam!!! Thank you for all the wonderful recipes you have given me this year… and most importantly, for your friendship! Love all white. I only have white towels in my home. Received this tip from a decorator friend of mine and have never been happier. It makes everything so much easier. My towels always look like new and Clorox keeps them very fresh. Best tip ever! I also use white towels in the bathroom, but I haven’t been able to disregard matching. Clorox Wipes were a must in my classroom wiping desktops after school. I’m sure that cut down on cold and flu germs especially during the winter months. The students appreciated a clean surface too since each desk was visited by six class periods of language arts. Have a blessed Christmas and thank you for sharing varied tips throughout the year. Great ideas Sandy! I don’t want to get sick over Christmas!!! Great tips for this time of year and always. I too use lots of Clorox and white linens in the bathrooms. As always, great post. Happy Holidays! Love these ideas, Yvonne! I’m also a huge fan of white linens and towels, it’s all I buy! I get them at TJ Maxx, Marshalls & Home Goods and I also bleach all of my linens and kitchen towels with Clorox as well. I’m also a big fan of their cleaner, Clorox Clean Up. When you clean the bathroom with that stuff, it makes it not only smell clean and super fresh, it does disinfect! It makes the whole house smell clean when you use that, and the Clorox wipes are great for touch ups and keeping my counters clean in my kitchen and bathrooms. I don’t know what we did before they came out with those cleaning wipes, I love them! My family visits me during the holidays, and I love my home to be clean and fresh so I sure appreciate these tips. Thanks & have a wonderful day! Hi Karen, Thanks for the great tips!!! Have a Merry Christmas with your family! 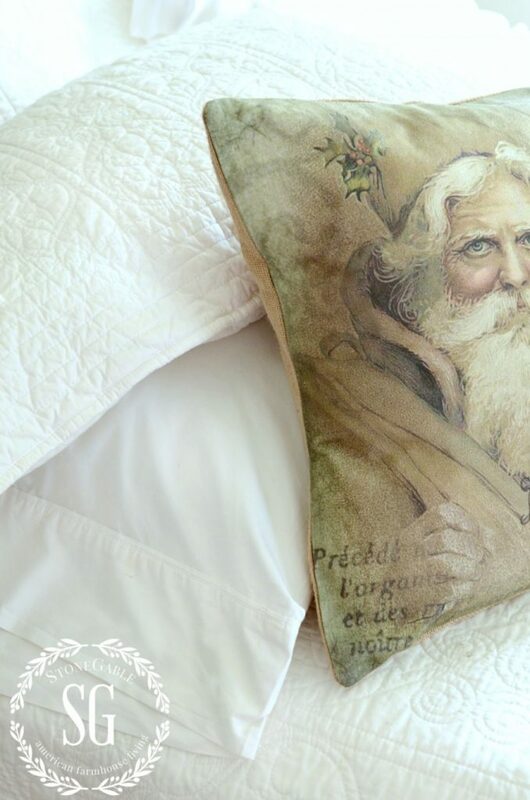 Hummmm…………..never even have given using white linens a thought but perhaps now is the time too. I’ll soon be buying new linens for the 3 bathrooms in our new house. 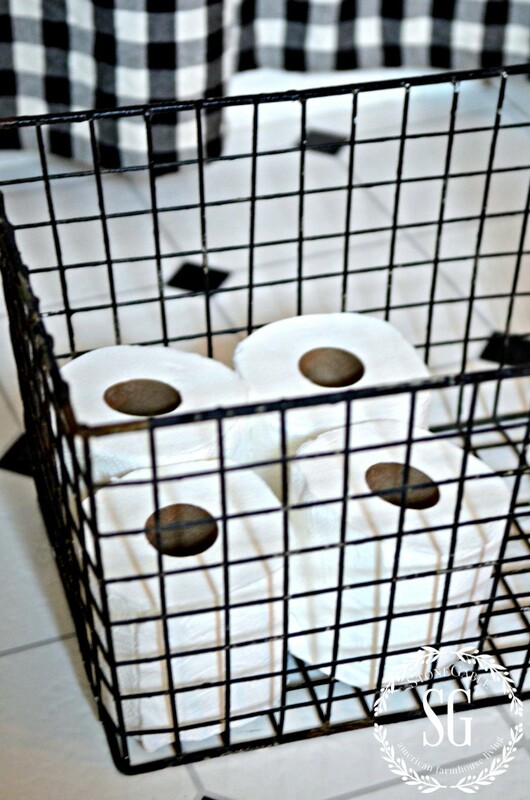 And, small trash can liners are a MUST for me! I cannot stand to go to someone’s house that does not have liners in their bathroom trash cans. :o)) It makes everything cleaner and nicer. Great post and food for thought! Christmas blessings!